On the Appalachian Trail, Gaylordsville, Connecticut. A few weeks ago we had a day of high winds in western Connecticut and because this area is pretty rocky and trees aren’t deeply rooted, wind can uproot and knock over even very large and old trees. The section of Appalachian trail between the New York/Connecticut border and Bull’s Bridge is called “Ten Mile Hill” and it’s a very nice four mile hike. The recent wind took down over 20 large trees on this section and we had a big crew of “sawyers” and “swampers” to clean it up. It was a lot of work and I was pretty sore when I got home (nothing beer and ibuprofen won’t fix). Toward the end of the day I took a few shots of a nice reflection on a small swamp. I was so tired my hands were shaking and I was pretty sure none of the shots would turn out but thankfully a few did. 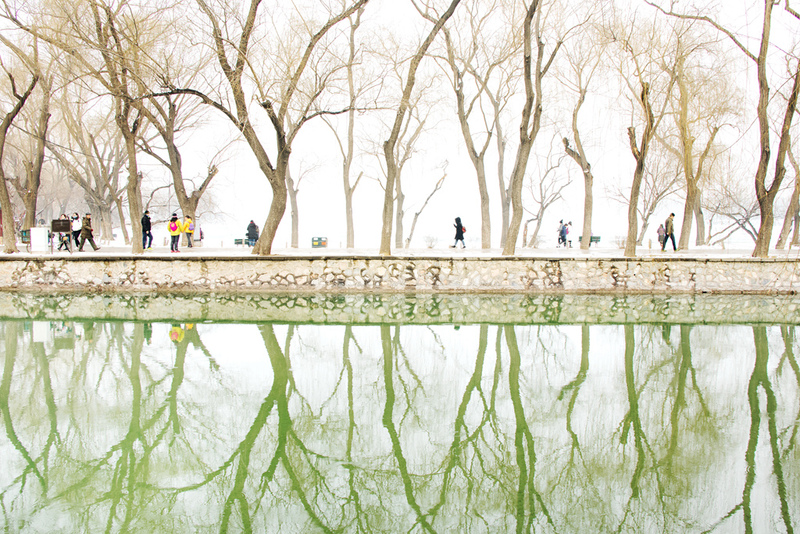 My flickr contact Liping YANG posted this fantastic reflection on a waterway in Beijing, China. I was back in the upper part of this spectacular ravine today doing more trail work. The light and the fall colors were so intense in this pool I stopped to take a few pictures. 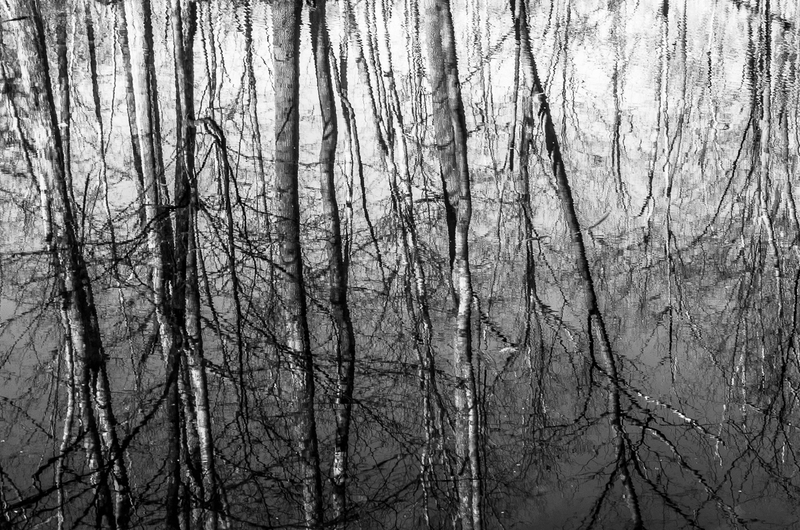 The water was too still and to me, the reflected seen had no interest as it was simply the far bank of trees turned upside down. There was no little dog to splash around in the pool to make waves so I tossed in a small rock just to mix things up. I took four pictures in rapid succession hoping one of them would have just the right amount of water movement in it. 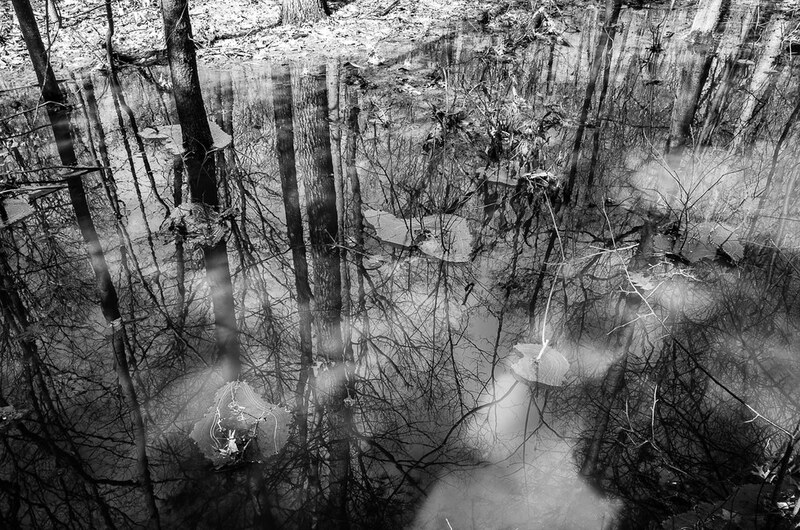 To me, the water movement gives this image a painterly feel. Note: this image is straight out of the Fuji X70. I ran it through Lightroom to downsize it for uploading but made no adjustments at all. We went on our regular flat hike on the Appalachian Trail from Cornwall Bridge south toward Kent. 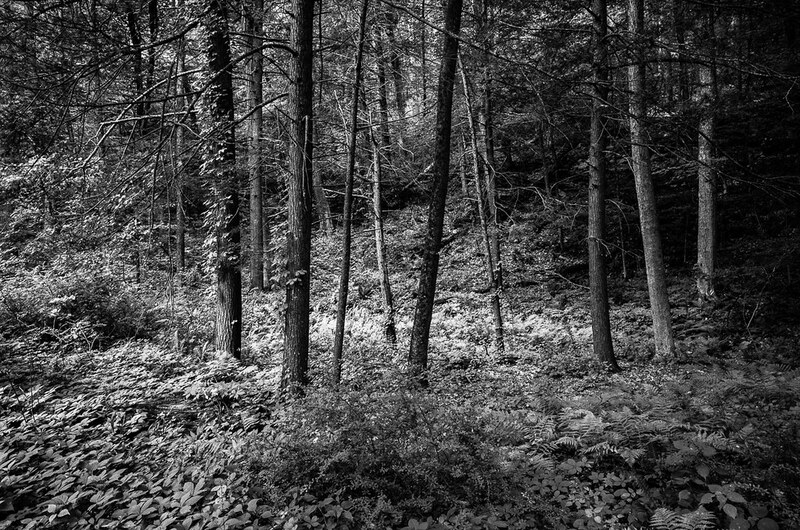 This small nicely-lit piece of forest was further down the trail, maybe half-way to Kent. 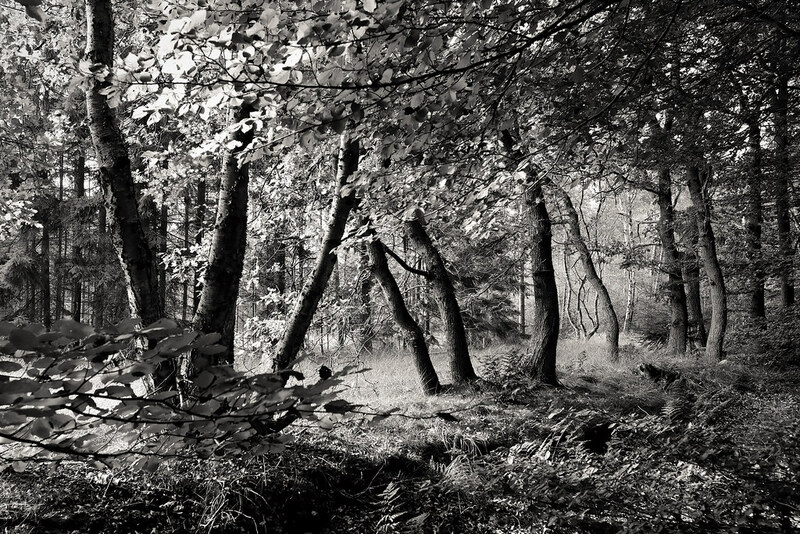 I’m always looking for these pockets of forest with the possibility of this kind of light to make things look interesting and even at mid-day when light is less than ideal the forest is dense enough here so that this kind of shot is possible. Between Sage’s Ravine (CT/MA border) and Mt. Race. I hiked the section of AT that I’m responsible to maintain in Massachusetts to clip brush and check for problems. The largest “bubble” of thru hikers is about to come through so I put some time in on both of my sections to make sure things are ready. This is such terrific section, with dense forest and great views on the south shoulder of Mt. Race. It’s a joy to hike it. Met about a dozen thru hikers today, some of whom I met down in Connecticut last week on my section there. 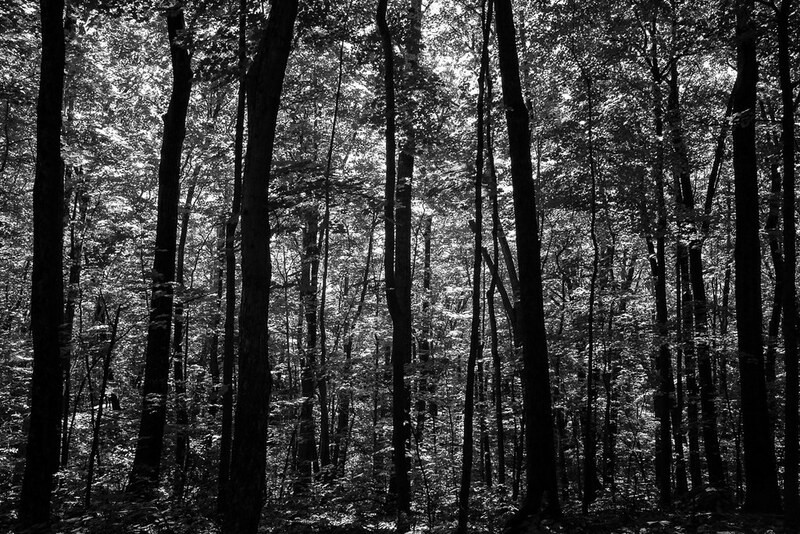 Note: I set the Fuji X70 to black and white with a red filter. This is straight out of the camera. I’m impressed with what this camera did. Appalachian Trail, between Bull’s Bridge and Kent, Connecticut. We hiked Schaghticoke Ridge yesterday to remove two trees (blowdowns) that had fallen across the trail. My next piece of work will be to re-blaze the inner section of this ridge (3 miles) . AT blazes are white paint, 2″ wide by 6″ tall. This brook was completely dry most of this past winter which is unusual, it’s usually the source of lots of ice photography. Because we’ve had such a weird winter with little rain, there is an abundance of leaves everywhere: on the trail and in streams. 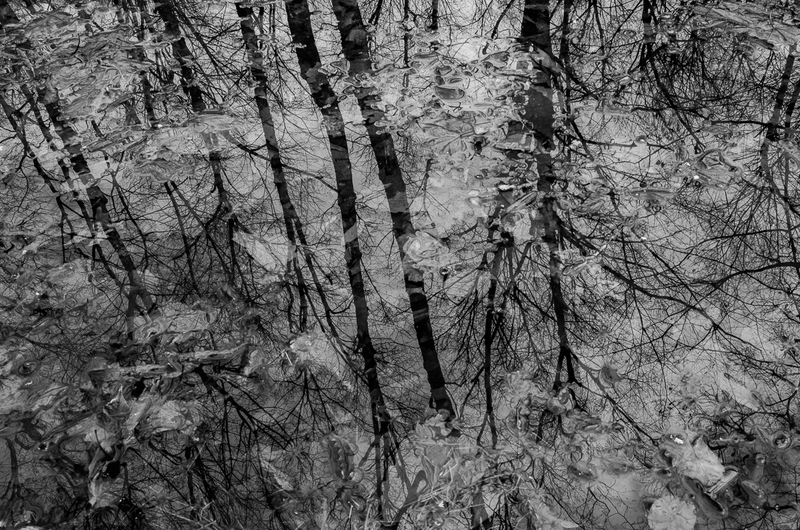 I shot about ten reflection images from different vantage points in two pools on this stream and while I’d usually attempt to just catch the surface (pure trees) it seemed like it might be nice to get leaves in the shot which give the reflection another dimension. I have to say, all of my images taken this day with the Fuji X70 turned out extremely well. I like the richness of the Fuji files and I’m shooting JPEG only as I don’t have a RAW converter yet for the camera. The camera’s controls, like the Ricoh GR’s are completely useable with thin gloves on and it feels like a very well made, sturdy tool in my hands. We took a short walk around a hill overlooking Lake Waramaug and I noticed this small swampy area right off the road. No doubt this water is from the heavy rains we had last week. It wasn’t “golden hour” by a long shot but trees were making interesting shadows and I thought it might be worth stopping to check out. 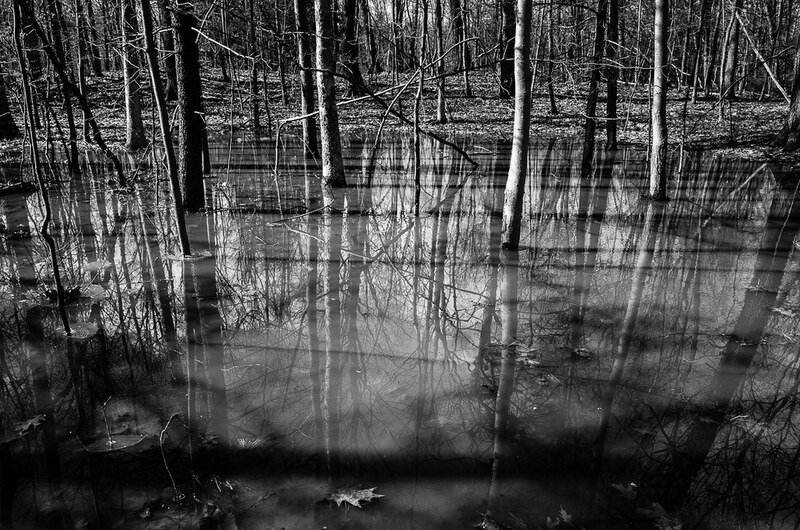 Lots happening here: shadows, reflections, and leaves both floating and on the bottom, not to mention the trees. I’d like to get back to this spot earlier in the morning or later in the afternoon to see if there are even stronger shadows. 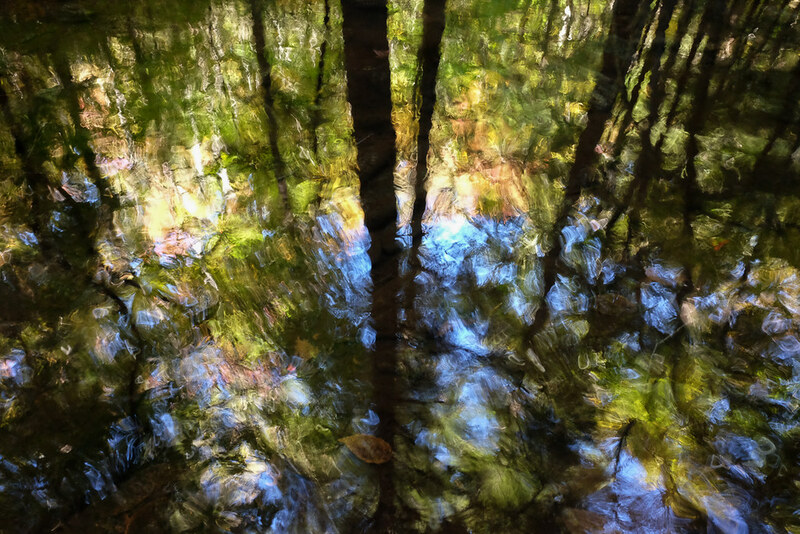 Thayer Brook, Appalachian Trail, Kent, Connecticut. It was “balmy” out the other day so I took a hike from Rt. 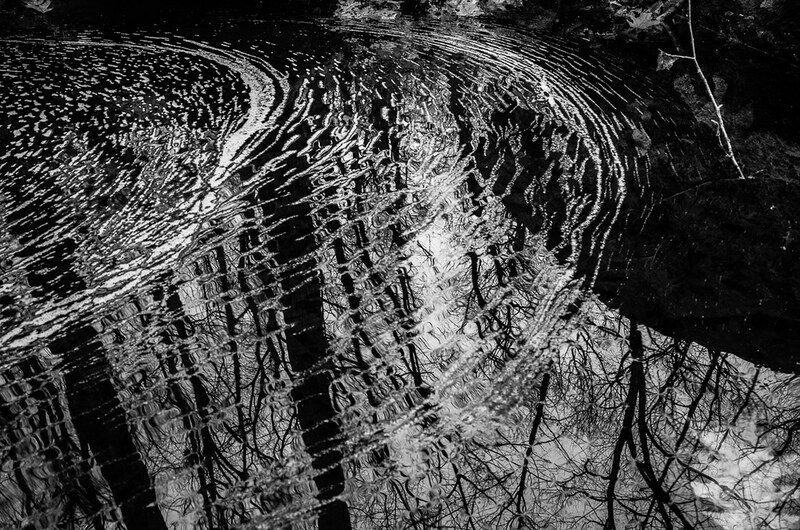 341 south on the AT to Thayer Brook to shoot ice, or, water patterns if there was no ice. There was no ice but there was enough water to make some nice patterns to shoot. These are foam ripples in a small pool with a few leaves under water, a twig on the right, and a big rock that forms the right edge of the pool. 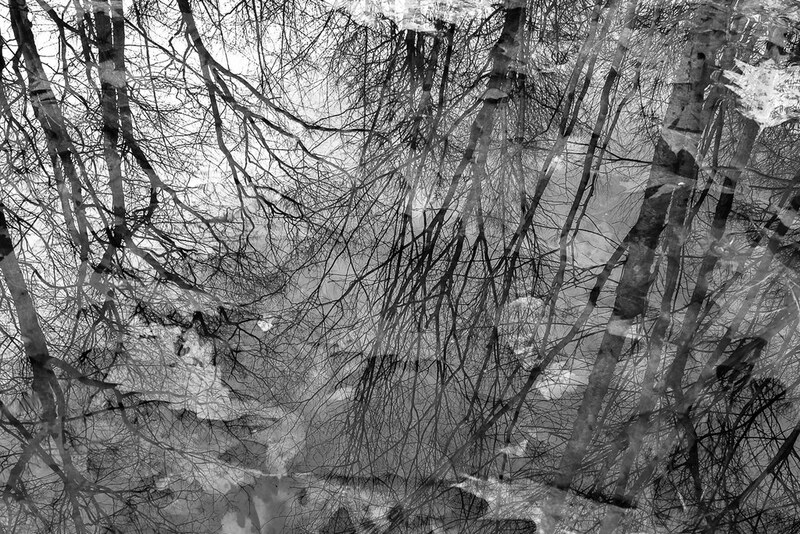 Oh, and a nice reflection of the oaks on the far side of the brook.